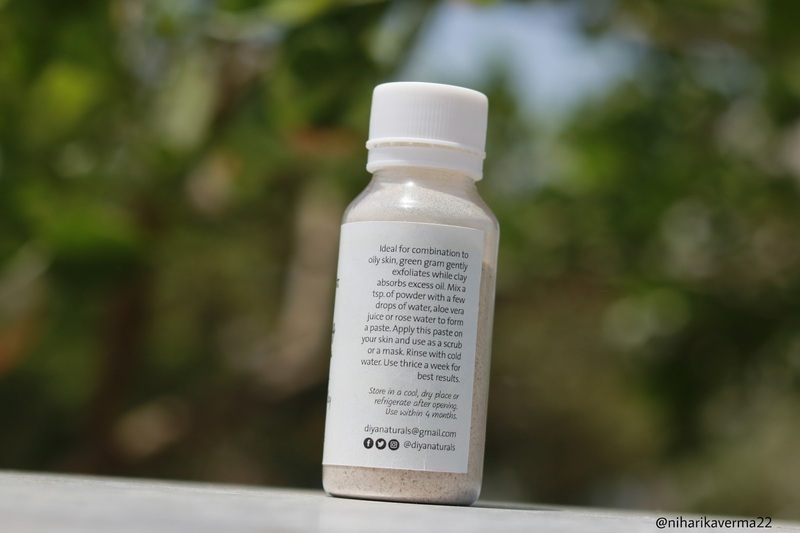 Handcrafted products that are kind to your skin and the environment. All Natural & contains no toxic. Proudly, Made in India. 😇 All Products are totally free parabens, preservatives or sulfates. See Complete Collection Here. 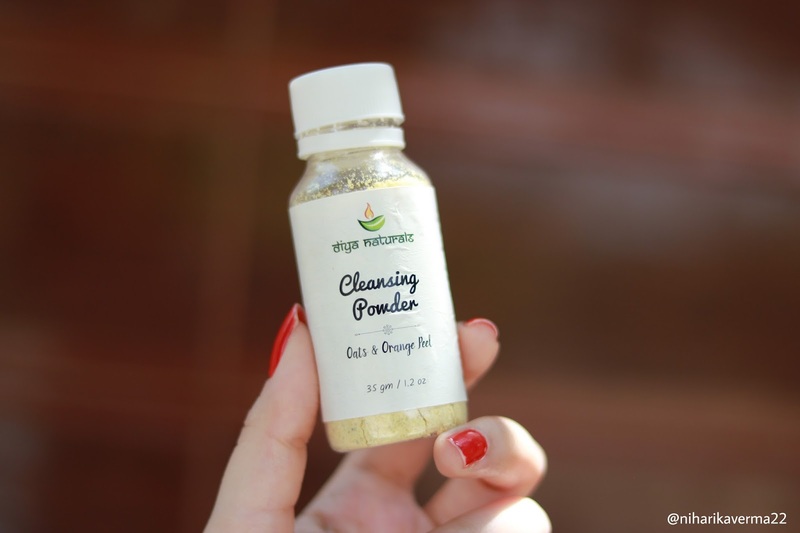 A versatile cleanser with oats to gently exfoliate and orange peels to energize your skin. Mix a tsp. 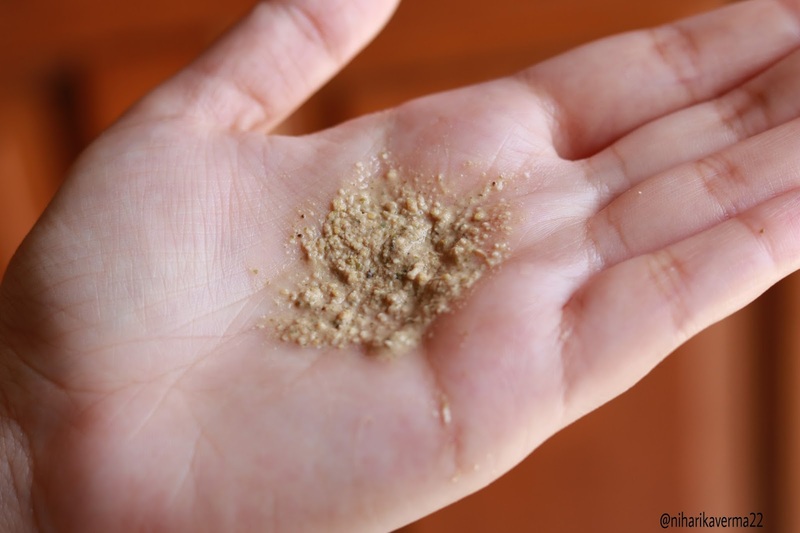 of powder with a few drops of water to form a paste. Massage this paste on your face or body. 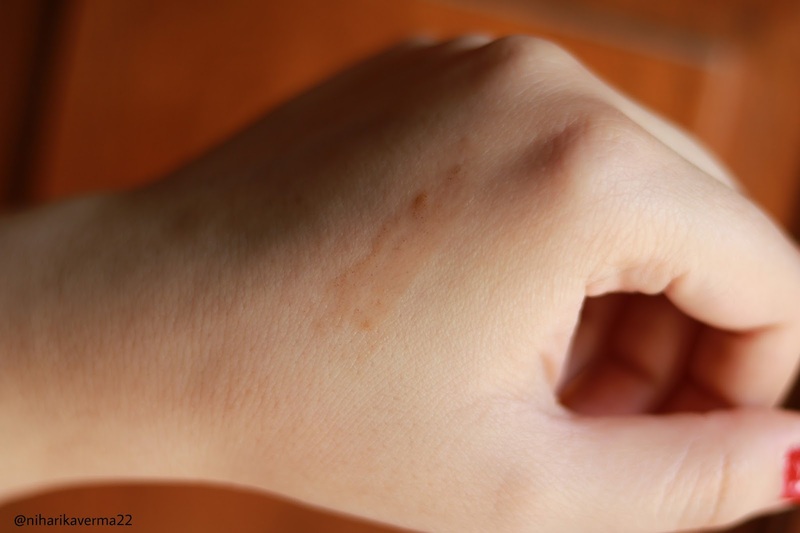 For Dry Skin, mix with milk or their Wonder Oil. For Oily Skin, use with Rose Water or Aloe Vera Gel. Oats, Gram Flour, Walnuts, Orange Peel and Turmeric. 👉Packaging: Comes in a simple plastic bottle with a screw cap. No Risk of Breakage or Wastage of Product. 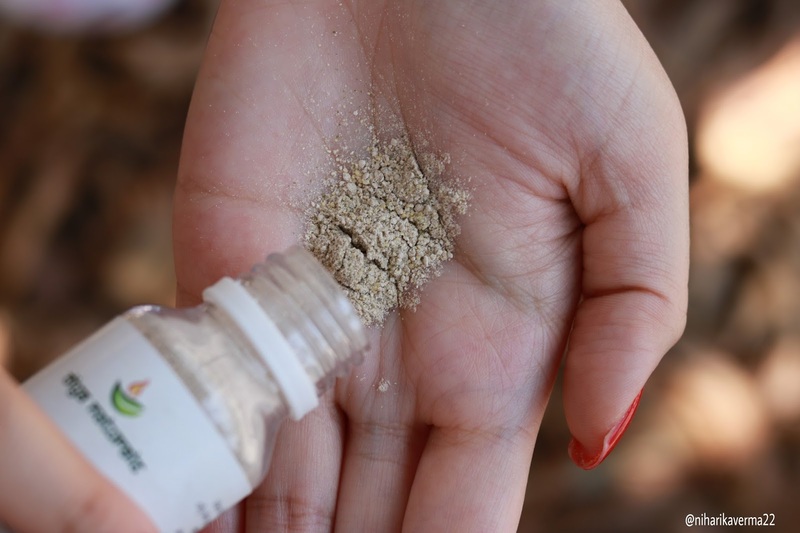 Simply tilt & tap the bottle to take out the powder on your palm. The Bottle opening is of perfect size - doesn't spill out much product. 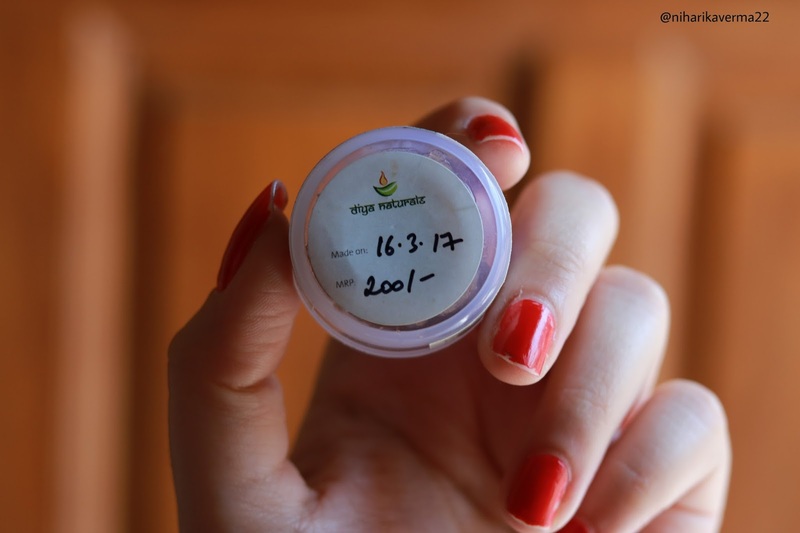 All the required information such as Date, Price, Ingredients & Description was mentioned. 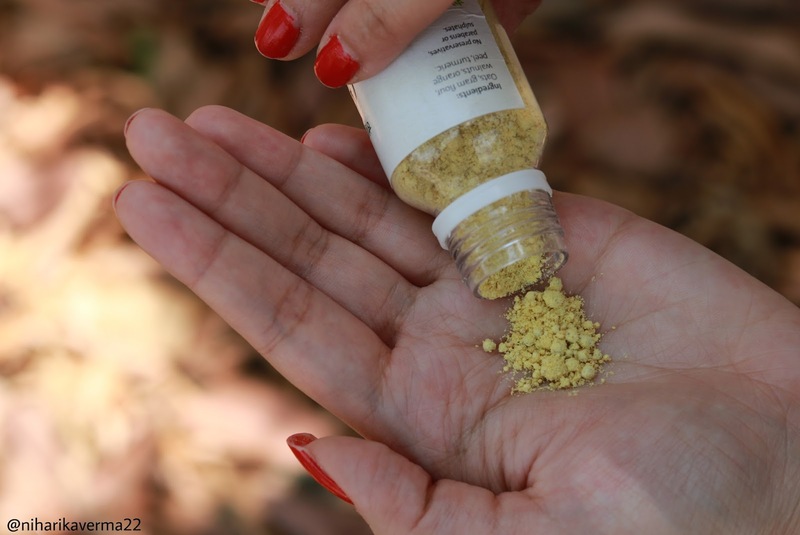 👉Color & Consistency: Yellow in Color & in Powder Form. Have to mix it with a mixing agent - Curd, Rose water or Aloe Vera Gel, anything to form a paste. 👉Fragrance: Dominant Gram Flour Fragrance with a hint of tanginess. Some may like and some may not. Those who are not comfortable with the smell of Gram, like me, may not find it pleasant. 👉Effectiveness: For me, it is something between a cleanser and a scrub. 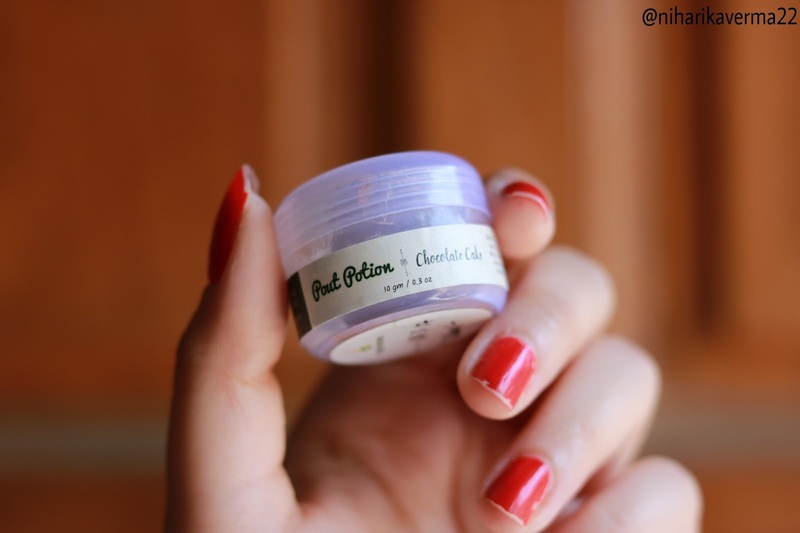 I have sensitive skin and I use it after mixing it with rose water. I tried using after mixing it water only and it results in a bit dryness. So always use it with a mixing agent. 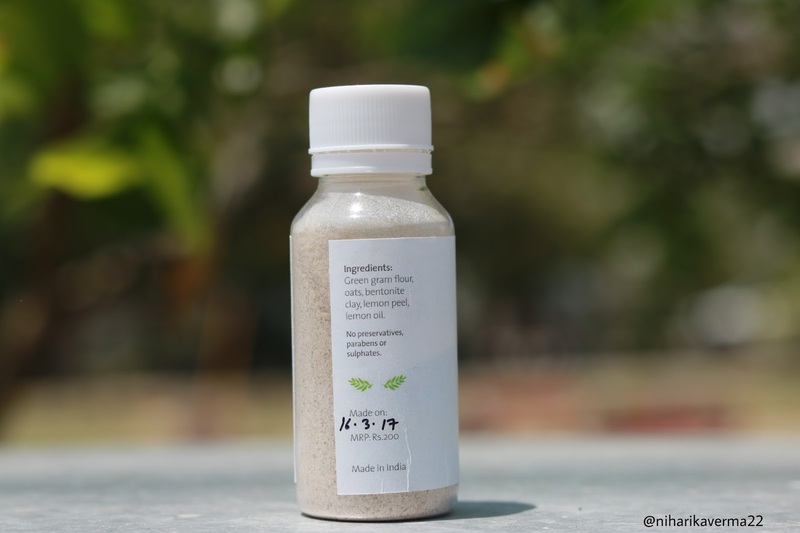 It doesn't have granules for exfoliation, the powder itself forms into lumps which help in mild exfoliation. 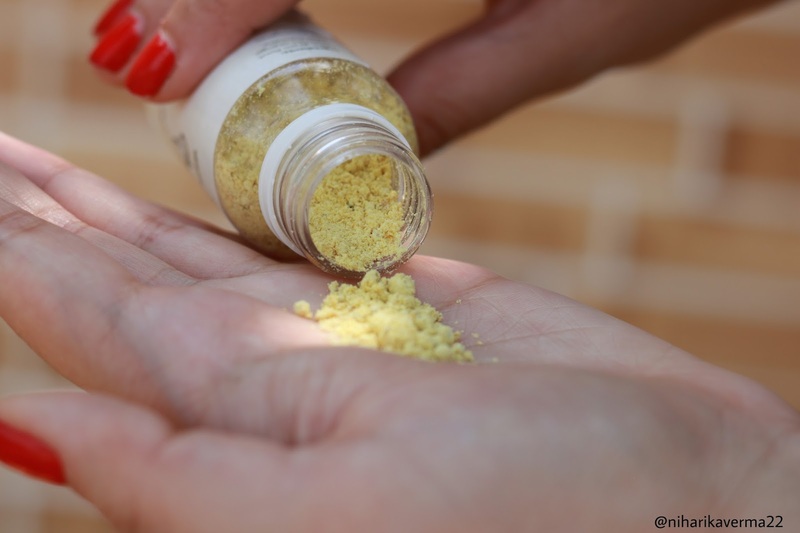 I use it only 2-3 times a week because Gram Flour is really a strong ingredient when it comes to cleansing. And by strong, I mean to say, it can cause dryness if used daily. 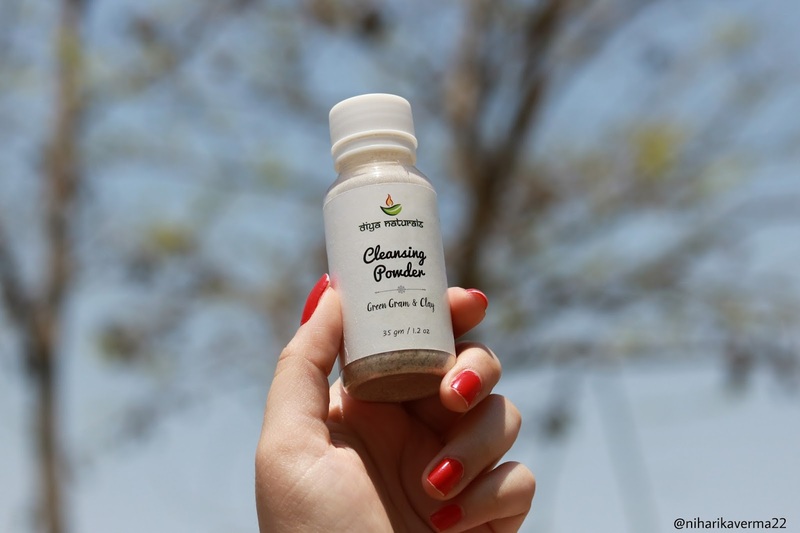 Ideal for combination to oily skin, green gram gently exfoliates while clay absorbs excess oil. Mix a tsp. 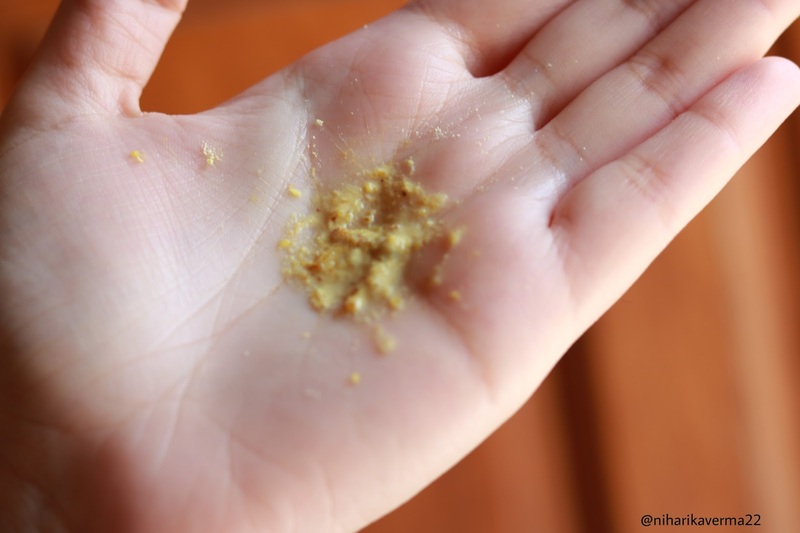 of powder with a few drops of water, Aloe Vera Juice or Rose Water to form a paste. Apply this paste on your skin and use as a scrub or mask. Rinse with cold water. Use thrice a week for best results. 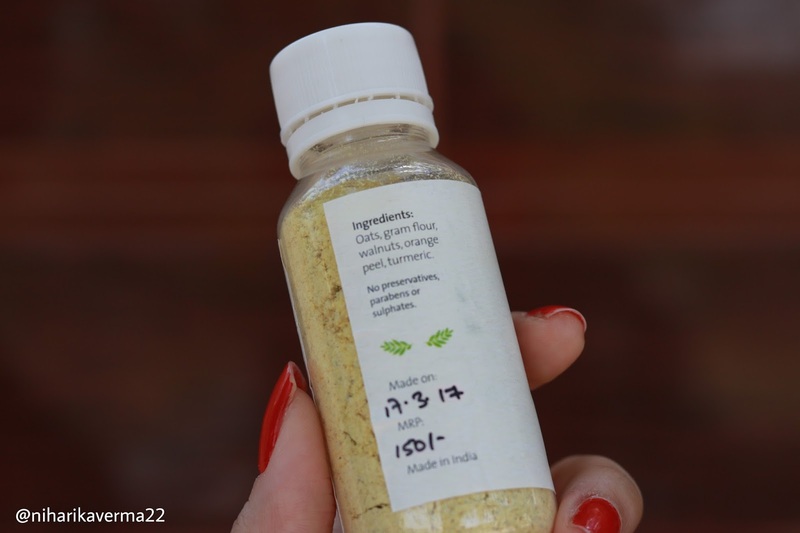 Green Gram Flour, Oats, Bentonite Clay, Lemon Peel & lemon Oil. 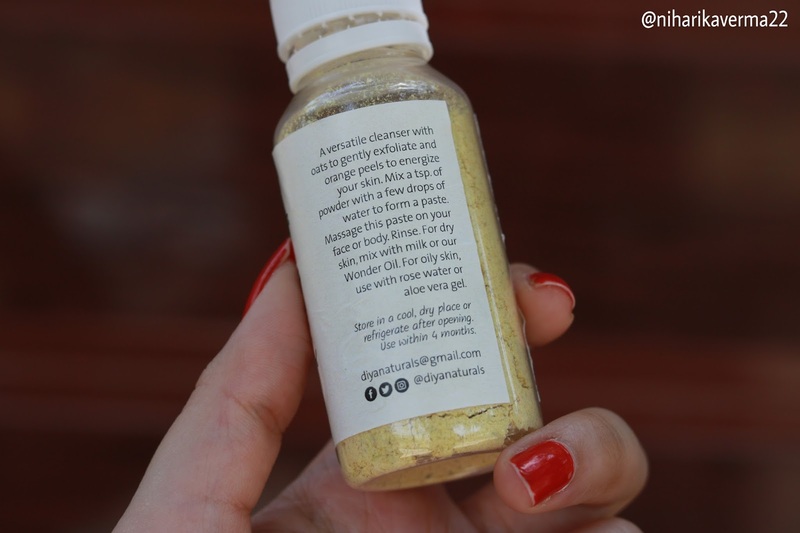 👉Packaging: Same like the Oats & Orange Peel Cleanser. 👉Color & Consistency: Muddy Grey Powder with tiny oats or gram particles. 👉Fragrance: Smells like a mix of Lemon & Gram. A bit refreshing. But again, some may like & some may not. 👉Effectiveness: Instructions on the label says that can be used 2-3 times a week. But I use it only once in two weeks. The reason is my skin sensitivity and the ingredient - Green Gram which is again a strong one. 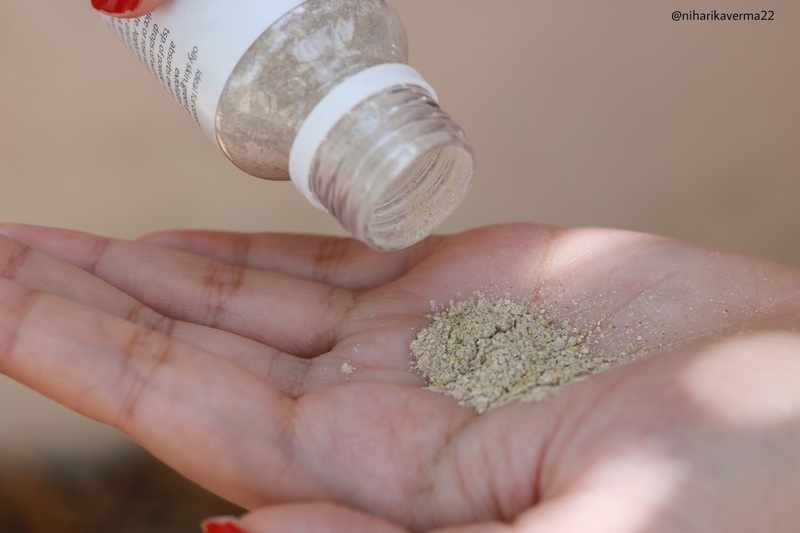 There are tiny particles which help in the exfoliation and the powder also forms into lumps when mixed with rose water, & they roll out on the skin which massages the skin well. Chocolate Lip Balm made with natural ingredients. No Preservatives, Parabens or Petrolatum. 👉Packaging: Comes in a tiny round plastic jar with a screw cap having a label wrapped around it. Can be easily carried in your handbag or even in the pocket. 👉Color & Consistency: Cocoa Brown in color & comes a Heart Shape. Consistency is very light & not waxy like our regular stick balms feel like. 👉Effectiveness: As I said, it is a very light formula, it doesn't feel heavy on lips. It is almost non-tinted and you have to take around 4-5 rounds of it to cover your lips in a good amount of lip balm. Doesn't feel sticky or waxy. 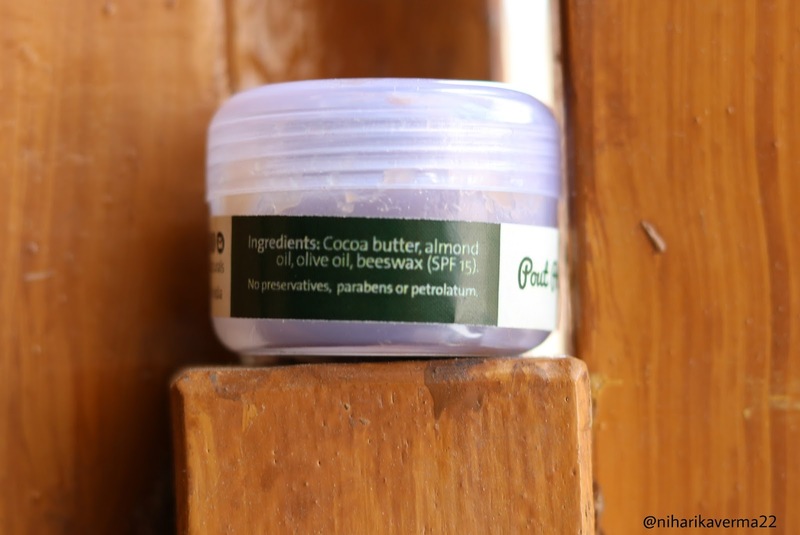 It feels like you have applied the real cocoa mixed with Almond & Olive Oil on your lips. If you are facing excessive dry lips issue, this may not heal it. But it definitely softens the lips instantly & gives relief from dryness & chappy lips temporarily. Available at their Facebook & Instagram Page. Never before i heard about them but they sound really interesting!! The look of the soap is awesome. Yes, I agree with you regarding gram flour. I don't use it at all so. The lip balm is quite good I think. 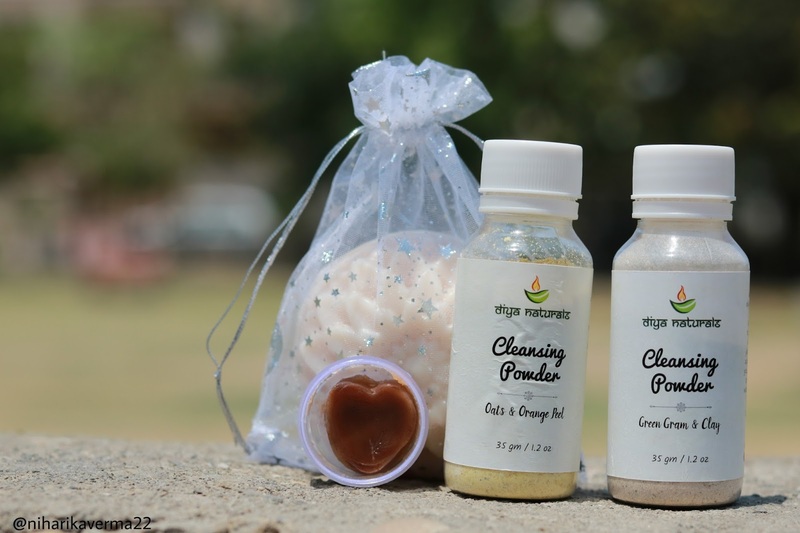 Soap looks beautiful and the cleansers sound promising!! This looks amazing -have to check it out. Thank you for sharing!